The International Medical Center actively helps the University of Tokyo Hospital to open its doors to overseas patients who seek to receive our state-of-the-art medical care. In addition, the Center will facilitate to create an environment that fosters international exchange in the area of clinical education. One of the University of Tokyo’s significant challenges is globalization. The International Medical Center was launched on November 1, 2012 as a significant step forward in enhancing The University of Tokyo Hospital’s development as an international hub. Spreading the University of Tokyo Hospital’s state-of-the-art medical care to the world. Facilitating active international personnel exchange. 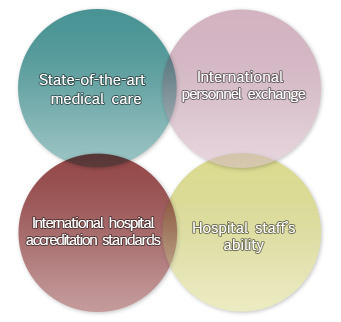 Organizing response to international hospital accreditation standards. Improving the hospital staff’s ability to cater to international needs. 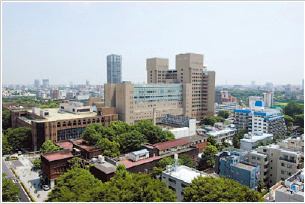 The University of Tokyo Hospital offers sophisticated surgery and state-of-the-art treatment in variety of fields. One of the roles of the International Medical Center is to establish a system through which we provide medical expertise to patients from overseas. In the past, some foreign patients have successfully received treatment thanks to the support of individual departments. However, from henceforth, the International Medical Center will cater to the various requirements that must be met when accepting overseas patients, including multilingual support, translation of medical documents, and offering solutions to financial challenges, so that each department can focus solely on providing sophisticated treatment to those patients. For example, a multilingual website has been opened since the end of the fiscal year 2013 and there have been over 80,000 hits from 175 countries so far. Clinical trials of machine translation system have been also conducted. As well as receiving patients, another important aspect is the globalization of clinical education. We hope to establish a system in which non-Japanese doctors accepted for residencies, or those who come to receive cutting-edge medical training can carry out operations, interventions or demonstrations without being hindered by their nationality. Similarly, we hope to establish a system through which overseas doctors can learn new techniques alongside Japanese doctors, and to provide an environment where doctors from various countries can mingle with young doctors working at our hospital, as well as student physicians in participatory clinical training. We have been actively accepting advanced clinical trainees granted permission by the Ministry of Health, Labor and Welfare under the Exceptional Cases of the Medical Practitioners Act, Article 17, regarding Advanced Clinical Training of Foreign Medical Practitioners, etc. Internal hospital rules to accept consultant level foreign medical doctors as Invited Faculty member has also been settled. Lastly, heightening the capability of physicians and medical staff to cater to international needs is an important factor in globalizing The University of Tokyo Hospital. To this end, the International Medical Center will attempt to cultivate personnel by hosting various international exchanges and language-training programs so as to further develop the hospital’s capabilities to become an international hub in the field.